I'm honestly not really sure how Chinese these cookies really are, but I do love them. We didn't necessarily eat them during Chinese new year, but whenever they came at the end of a banquet meal or in a box from the Chinese bakery, I was the first to grab them. Cookies are not generally a staple of the Chinese dessert menu. Fluffy cakes, sweet buns and fruit yes. Cookies... nope. So we always jumped at a chance to have one. These are crispy, buttery, with a slight almond flavor and remind me of the sweet crunchy topping on the top of pineapple buns. They make me feel like a kid again and I can't get enough of these Chinese Almond cookies! These cookies are made from a simple dough. Butter and sugar get creamed in a stand mixer till light and fluffy. One large egg is added then the almond extract. I love how almond extract perfumes the room once its added! To this the flour, baking powder get mixed in and that's basically it. The dough gets scooped out onto parchment lined baking sheets. I used a medium sized cookie scoop for this. Then the mounds of dough get flattened with the bottom of a glass so that they are about 1/2" thick. I then scored each cookie with cross hatches (my mom thought it made it look pretty, I'm not sure if made a huge difference in the end, so that part is optional) Then gently press a whole almond into each cookie. You can also use blanched almonds or sliced almonds If you prefer, but I thought the whole almonds were cute. 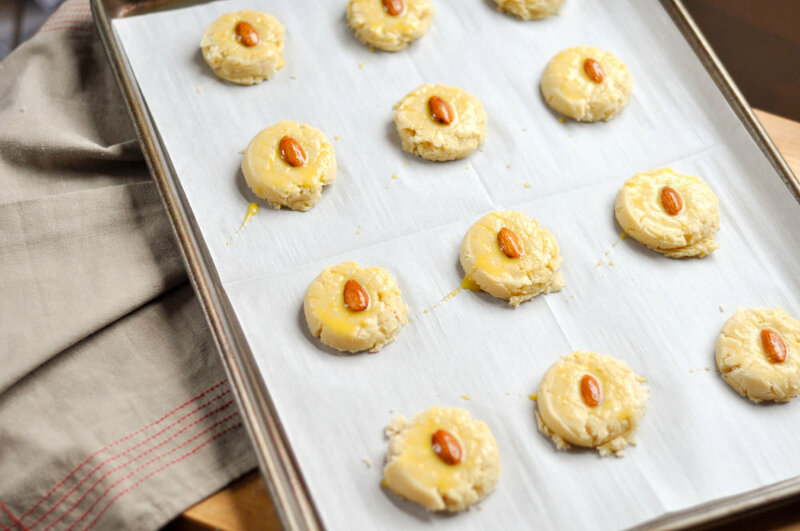 Brush the tops of these cookie rounds with egg wash and bake at 325F for 14-16 minutes or until the cookies are golden brown on the bottom and have a yellow tinge on the tops. Allow to cool and enjoy! These cookies are a family favorite and a great snack to bring for any Lunar New Year celebration! Actually I might just make these the next time one of my kids has an international food festival. Beat in egg and almond extract. Add the flour mixture to butter and mix to combine. 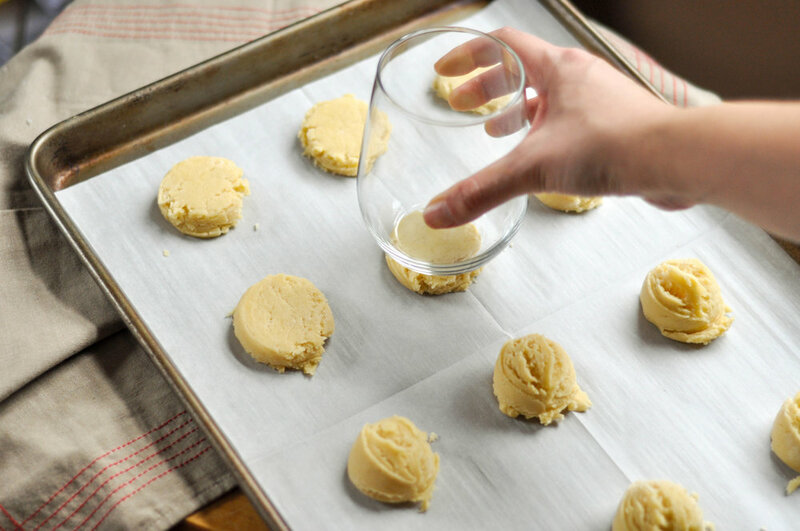 Using a medium cookie scoop, Scoop the cookie dough into rounds and Place on prepared baking sheets, 2-inches apart. Flatten to ½-inch thick with the bottom of a drinking glass. Gently press a single almond halfway into the center of each cookie dough ball. Brush the tops of the cookies with the egg wash.
Bake 14 to 16 minutes or until lightly golden brown. Cool for 2 minutes before transferring to a wire rack to cool completely. Enjoy!